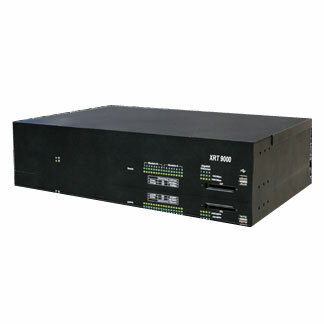 XRT 9000 Gateway is designed to perform protocol translation for equipment and applications wishing to interact with the MOTOTRBO Connect Plus digital trunking system. XRT 9000 is an Internet Protocol (IP) based device that allows connectivity from authorized clients that are part of the Motorola Solutions Application Development Partner (ADP) Program. The XRT 9000 Application Protocol Interface (API) is a published document available to all Motorola Solutions Application Development Partners. The total number of Talk Paths registered by all clients cannot exceed the number of registered talk paths IDs licensed for the XRT 9000 which is a maximum of 100. Please refer to the XRT 9000 Gateway User Guide for Talk Path definition. The number of licensed Talk Paths determines how many Group and Private IDs can be registered by all clients, but not the maximum number of simultaneous calls. The maximum number of simultaneous calls on a single XRT 9000 is 30. R1.2 supports Emergency Alert to console and Network Wide All Call from console. R1.2 supports Emergency Alert to console and Network Wide All Call from console. 1. The XRT 9000 Gateway is only required on Connect Plus systems needing Avtec Scout or Genesis GW3 TRBO® (this may also be required for future ADP applications on connect plus). 2. Uninterrupted Power Supply (UPS) backup required for continuous operation of XRT 9000 Gateway and networking equipment during power outages. 3. The XRT 9000 Gateway and other Connect Plus Trunking system equipment can be ordered as part of the Assembled Trunked System (ATS) program for staging at Motorola CCSI (Customer Center for System integration). 4. Racks / cabinet equipment is required for system staging at CCSI. 5. Please refer to the Connect Plus System Planner and your Motorola ACES team representative for presale support and system design considerations. 6. An email containing the upgrade will be sent to the address entered in the order. Please note each upgrade is approximately 3M in size. If your email account cannot manage this size mail, a CD version of the upgrade will be mailed to you provided the HKVN4143 is ordered along with the XRC 9000 Field Upgrade Package. * Motorola offers an “uplift” to standard warranty, providing a 48 hour replacement. This service can be purchased anytime during Motorola Standard Warranty (equipment failures prior to uplift purchases are excluded from the 48 hour cycle time). For more information contact your Motorola Dealer or Motorola Sales Account Manager.